Colt louvre systems can control light entry, provide ventilation whilst maintaining good levels of rain defence, providing screening, or a combination of these. 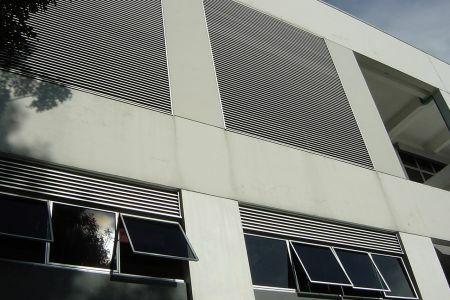 Louvres can also be provided simply for aesthetic impact. A wide range. Colt louvre systems are available in various shapes, configurations, materials, finishes and coatings to meet the requirements of almost any project. A large selection of optional accessories is available, such as mitred corners, special shapes or louvre doors. If noise reduction is required, acoustic louvre panels may be used. Specifying louvre systems is always a compromise, and requires some judgement to take into account the particular needs of each application. We can help you with this. please visit our design page for further information. Alternatively, please visit our seminar page where we offer you the opportunity to watch a recorded webinar as well as to discuss your requirements directly.